(Newser) – A school bus failed to yield to railroad crossing and stop signs and collided with an empty freight train in North Dakota yesterday afternoon, killing the bus driver and a 17-year-old student and injuring 12 other people, the Highway Patrol says. The accident happened on a gravel road a few miles east of Larimore in the northeastern part of the state, about 100 miles north of Fargo. A Highway Patrol spokesman says the train struck the bus on the passenger side, near the doors. 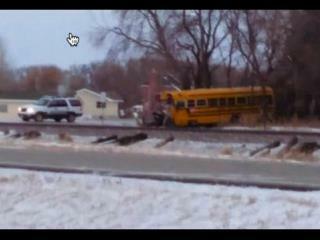 The 62-year-old bus driver and a 17-year-old student were ejected from the vehicle and killed. Unfortunately we can't ask the driver if the brakes failed. The train has the right-of-way................. No Frakken Crap Genius ! ! ! In Florida buses must stop at ALL rail crossings. If this driver did so, did (s)he try to "beat the train?"